JNN 10 July 2015 Karachi : Youm-e-Ali, the martyrdom day of the First Imam Hazrat Ali (A,S), was observed amid tight security across the Pakistan. To avoid any untoward incident, special security arrangements were made, while the mourning processions followed the planned routes and gather at the pre-decided venues. In Lahore, a mourning procession emerged from Mubarak Haveli and proceed through Chowk Nawab Sahab, Mochi Gate, Kucha Sheyan, Old Kotwali, Kashmir Bazar, Bhati Gate and concluded at Kerbala Gamay Shah. Participants of the procession offered Zuhr prayer at Chowk Rang Mahal. As part of security measures, the procession routes have been divided into 12 sectors and eight entry points have been made where 33 walkthrough gates have been installed. Monitoring of sensitive areas is being carried out through CCTV cameras, three drone cameras and a helicopter while cellular services on procession route remained suspended till conclusion of the event. 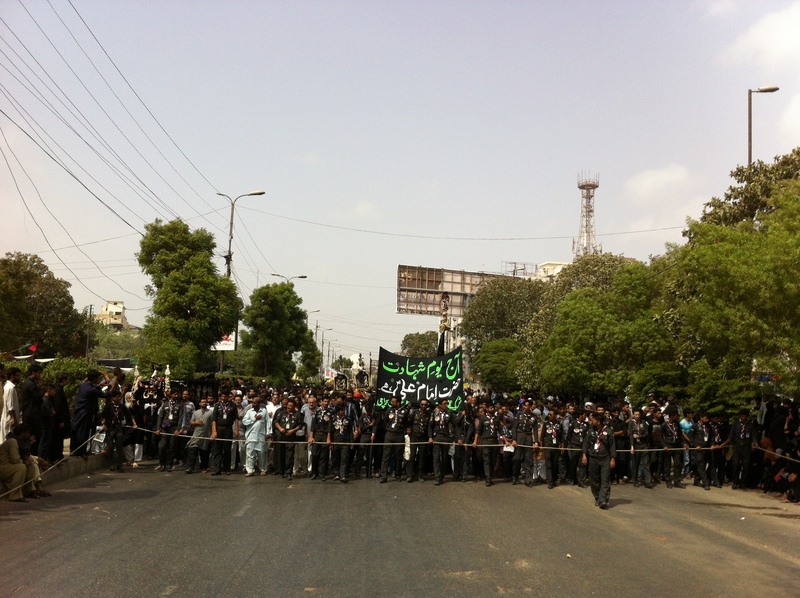 In Karachi, the mourning procession proceeded from Nishtar Park at 1:00pm and reached MA Jinnah Road. According to police officials, special robots were used for bomb-sweeping at the central procession from Numaish Chowrangi on MA Jinnah Road to Kharadar via Saddar. The robots, gifted by US and Britain to Sindh Police, can also be used to diffuse improvised explosive devices (IEDs). These special robots are controlled through specialised vans. Main route of the central procession was sealed by placing containers and remained shut for normal traffic today, while pillion riding in the city is also banned. In Quetta, pillion riding has been banned for two days under section 144 as part of the security arrangements for Youm-e-Ali procession. Main procession was taken out at 9:30pm and proceeded through Nechari Chowk, Alamdar Chowk, Abdullah Masjid Street, Kansi Road, Megangi Road, Archer Road Cross, Art School Road, Prince Road, Safeer Masjid Chowk and concluded at Alamdar Road Nechari Chowk. In Peshawar, the district administration has imposed section 144 for three days to avert any untoward incident. This entry was posted in Asia Pacific, Pakistan News and tagged 21 Ramzan, Imam Hazrat Ali, Martyrdom of Hazrat Ali, Youm e Ali. Bookmark the permalink.